Lord Hayagrīva is one of the Avatars of Para Vāsudeva. He is Aniruddha-amśa. In this Embodiment, the Śrī Hayagrīva’s face alone is that of a majestic horse and the body is like that of a human, except that it is pure sāttvic emanation. He is the embodiment of Prāṇava (Oṁkāra). He is the First Lord of all Vidyās (wisdoms). During Pralaya (dissolution of universe at the end of cycle), Mūla Prakriti (primordial Matter element) reaches the subtle state of Tamas (darkness). The Jīvas are embedded in that Tamas and suffer very much. Vyūha Vāsudeva incarnates as Aniruddha (incarnation of Lord Nārāyaṇa meaning “without obstacles”) and rests on the swirling torrent of Pralaya waters. He engages in Yoga Nidrā (Yogic Sleep) and reflects on how He can create the world anew and save the suffering jīvas locked in Tamas. During the Yoga Nidrā, He creates Brahma Deva from the Lotus arising out of His Nābhi (Navel). Next, He instructs Brahma Deva on the Vedas and the meaning of all the Four Vedas. He also blesses Brahma Deva on the intricacies of Sṛishṭi (Creation). Before the creation of Brahman, His saṁkalpa led to the existence of two drops of water on the lotus leaf below the lotus flower. These two drops of water became the Asuras - Madhu with Tamas Guṇa and Kaiṭabha with Raja Guṇa. They entered the lotus flower through the stem. There, Brahma had just concluded creating four Vedas as four beautiful children. The two Asuras grabbed the four babies and ran off to the nether world (Pāṭala). Brahma was heartbroken over his inconsolable loss. He could not continue with the creation of the world without the help of the Vedas, which were his eyes and guides. 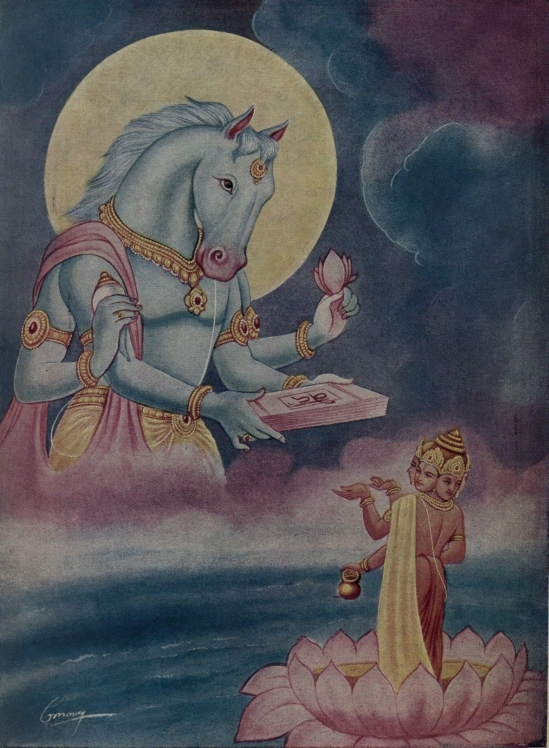 Brahma Deva approached Aniruddha Bhagavān and begged for help. Aniruddha took the form of Horse Faced (Human Body and a Horse’s face down to His neck). The hue of the Avatāra mūrti was clear white like a crystal. This is the Hayagrīva Mūrti. He proceeded to the hiding place of the two Asuras in Pāṭala and raised the sound of Udgītha Prāṇava. The Asuras were frightened on hearing the sound of Udgītha. They dropped the four children (Vedas) and ran towards the direction wherefrom the Udgītha originated. At that time, Śrī Hayagrīva recovered the children and returned them to Brahma Deva and restarted His Yoganidrā as Hayagrīva. The Asuras ran back to where they stole the Vedas and found Hayagrīva engaged in Yoga Nidrā. The Asuras made a lot of noise and woke up the Lord. Śrī Hayagriva got up from His bed of Ādi Śeṣa and fought with the Asuras and destroyed them. Afterwards, Śrī Hayagrīva reinstructed Brahma Deva on the secrets of creation using the Vedas and returned to His eternal Vaikuṇṭha.